With so many lakes and rivers, Iceland is a terrific place for trout. Here, it’s stuffed with fennel, herbs and orange and baked on foil that’s been well buttered so the skin gets nicely golden. Preheat the oven to 350°. In a medium saucepan, melt the 4 tablespoons of butter. Add the onion, fennel, scallions, garlic, thyme, lovage, orange zest, orange juice and sugar and bring to a simmer. Cook over moderate heat, stirring occasionally, until the onion and fennel are softened but not browned, about 8 minutes. Stir in the wine and simmer for 5 minutes. Let cool to room temperature. Rub the trout all over with the oil and season with salt and pepper. 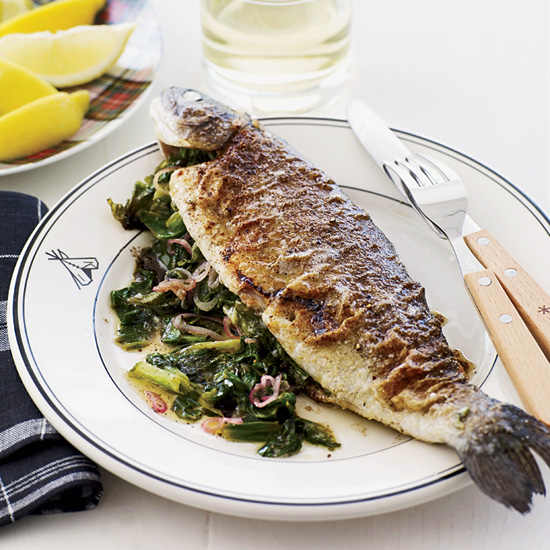 Drizzle the melted butter on a foil-lined baking sheet and set the trout on top. Spread the honey mustard all over the inside of the trout and fill the cavity with the orange slices, overlapping them slightly. Spoon the fennel mixture on top of the orange slices. Tightly wrap the trout in the foil and roast in the oven for 30 minutes until almost cooked through. Unwrap the trout and roast for about 10 minutes longer, until the skin is golden and the flesh is just cooked through and flakes easily. Scoop out the fennel filling and fillet the trout; discard the bones and oranges. Arrange the fish and fennel stuffing on a platter and serve.